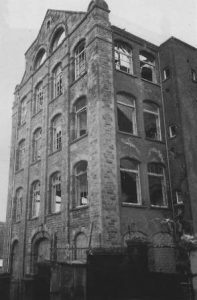 Built in 1899 by Daniel Conroy for the Bayer Company, The Star Factory is part the unique group of Derry shirt factories; all fine pieces of 19th Century industrial architecture. 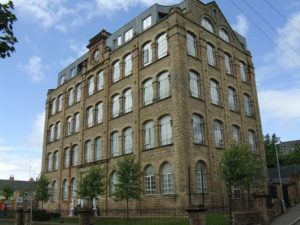 One known as ‘the magnificent five’ but in 2003 the B+ listed Tillie and Henderson factory suffered from illegal demolition, marking a backward step for heritage–led regeneration and conservation of the history and culture of the city. ‘Featuring in the Buildings at Risk catalogue series Volume 2 (1994), there has be various applications and hope for the Star Factory over the years. 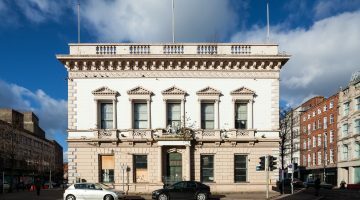 Like many vacant and vulnerable Buildings at Risk– this too was proposed for demolition in 1996 but was refused, recognising the building’s potential and historic significance. In 2007 the Department of Social Development– North–West Development Office restored the buildings into contemporary apartments, showcasing how historic buildings can meet modern day standards of comfort and ensuring the building doesn’t meet the same fate as the Tillie & Henderson factory. NIEA Listed Building Grant Aid; DSD.